Interstate 97 is the shortest two-digit Interstate in the 48 contiguous states. With only 17 miles, I-97 also lies wholly within Anne Arundel County. 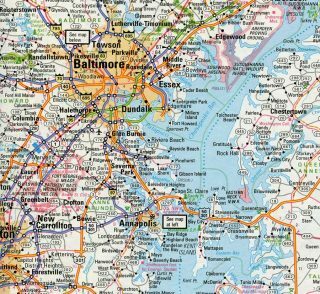 It generally serves as a commuter route between Baltimore and Annapolis. Two freeways make up the alignment of Interstate 97: the Glen Burnie Bypass (former Maryland 3) to the north and the former eastern extent of Maryland 32 to the south. The north end includes a direct connection with Interstate 895 Spur to the Baltimore Harbor Tunnel. Interstate 97 replaced portions of Maryland 3, which was the northernmost extent of U.S. 301 until 1960, when it was redirected to end at Glasgow, Delaware. 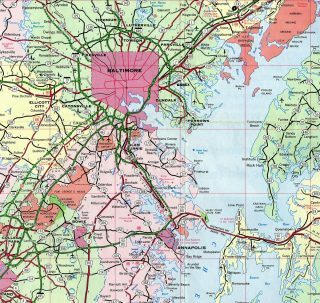 During the 1970s, Maryland proposed routes for both Interstate 68 and Interstate 97 in the Annapolis area. I-68 was planned for U.S. 50 between the Capital Beltway and a point west of Annapolis. I-97 was projected for a north-south route from the end of I-68 to the Baltimore Beltway. In addition, the U.S. 50 freeway east from I-68 and I-97 to the present end of I-595, was incorporated as Interstate 197. Interstate 297 was also introduced as the replacement for Maryland 3, from U.S. 50 and 301 north to Maryland 32. AASHTO approved I-97 north of U.S. 50 and I-297 on November 15, 1975. Conditional approval was granted to I-197 and to the I-68 segment as an extension of I-97. Further changes from Maryland regarding Interstate 97 were submitted to AASHTO on October 3, 1981. Again Interstate 68 was proposed in place of I-97 for the U.S. 50 freeway between the Capital Beltway and the previously referenced point west of Annapolis. The I-197 spur east from there to Maryland 70 was then proposed as Interstate 168. These changes were approved AASHTO by subject to FHWA concurrence. Interstate 197 was never signed, Interstate 297 was never built, and by 1989, both proposed I-68 and 168 were instead renumbered as Interstate 595. 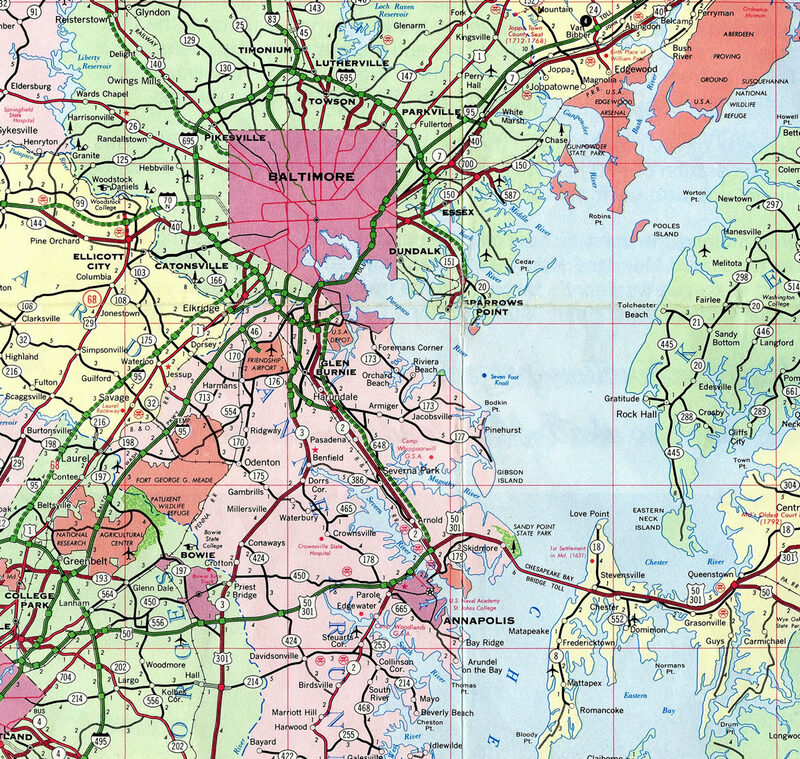 The 1966 Maryland Official Highway Map showed the path of the Arundel Expressway, the predecessor to Interstate 97, as slated for completion in 1969. Interstate 97 first appeared in the 1989 edition of the Rand McNally North American Road Atlas. Interstate 97 was constructed as a stand alone freeway parallel to Maryland 178 southeast from Maryland 3 and 32 to U.S. 50 &amp; 301. The remainder replaced Maryland 3 along both Crain Highway and the Glen Burnie Bypass. Interstate 97 progresses through Ferndale with three northbound lanes to Exit 17 with the Baltimore Beltway. Photo taken 06/25/10. The mainline of Interstate 97 transitions into Interstate 895 Spur, a connector leading north from the Beltway to the tolled Harbor Tunnel Thruway by the Port of Baltimore. Photo taken 06/25/10. Exit 17A departs next with two lanes for the inner loop of Interstate 695 to Linthicum Heights, Catonsville, Pikesville and Towson. Connections with MD 295 (Baltimore-Washington Parkway) lead motorists to Downtown Baltmore from I-695 west. Photo taken 06/25/10. A flyover ramp departs from I-97 north at the Furnance Branch Road underpass for the left side of Interstate 695 west. The ensuing ramp (Exit 17B) joins the right side of I-695 east to Dundalk and Port of Baltimore facilities at Sparrows Point. Photo taken 06/25/10. Interstate 97 ends as Exit 17B parts ways for I-695 east to the tolled Francis Scott Key Bridge and Essex. I-895 Spur extends the freeway east to a loop ramp for I-695 west ahead of the exchange with MD 648 at Ferndale. The spur otherwise defaults motorists northward directly to the Harbor Tunnel Thruway toll plaza along I-895 north. Photo taken 06/25/10. A loop ramp merges onto Interstate 695 west from I-895 Spur north to connect I-97 north with MD 648 at Ferndale. Exit 4 joins the Baltimore Beltway mainline with Interstate 97 south to Glen Bernie next. Photo taken 08/07/04. Exit 4 loops onto the south end of I-895 Spur as it transitions into Interstate 97. I-97 leads south to U.S. 50-301 east to Annapolis and the Chesapeake Bay Bridge and west to Bowie and Washington, D.C. Photo taken 08/07/04. Interstate 695 arcs southeast from Maryland 295 (Baltimore-Washington Parkway) between the Linthicum Heights and Pumphrey communites to Interstate 97 at Exit 4. Photo taken 07/02/10. The wye linking I-695 east with I-97 south and from I-97 north to I-695 west ties into inside lanes of the Baltimore Beltway. Interstate 97 comprises a commuter route south through Anne Arundel County suburbs between Glen Burnie and Annapolis. Photo taken 07/02/10. Traffic partitions for Interstate 97 south (Exit 4) simulteanously with the departure of Exit 5 to MD 648 (Baltimore-Annapolis Boulevard) at Ferndale. I-97 south links Baltimore with U.S. 301 to Bowie and Richmond, Virginia. Photo taken 07/02/10. Interstate 97 navigates southeast through a series of S-curves through forest land toward U.S. 50 & 301 (John Hanson Highway) at Exit 1. Photo taken 08/27/05. Traffic separates in a half mile for sweeping directional ramps for U.S. 50 west & 301 south to Bowie, Waldorf and Washington, DC and U.S. 50 east & 301 north to Annapolis and the Chesapeake Bay Bridge to Maryland’s Eastern Shore. Photo taken 08/27/05. A two-wye interchange joins I-97 with unsigned Interstate 595 and U.S. 50-301. The eastbound connection joins a collector distributor roadway to Maryland 665, an expressway spur east into Annapolis. Photo taken 08/27/05. Succeeding off-ramps depart unsigned I-595-U.S. 50 west & U.S. 301 south over the course of 1.25 miles for MD 2 south, MD 450 (West Street) and Interstate 97 north. Photo taken 12/31/16. A parclo B2 interchange (Exit 23B) joins U.S. 50-301 (John Hanson Highway) with MD 450 one half mile ahead of Interstate 97 north. MD 450 is the historic alignment of U.S. 50 west from Annapolis to Bowie. Photo taken 12/31/16. Exit 21 forms a westbound c/d roadway joining U.S. 50-301 west with Interstate 97 north to Glen Burnie and Baltimore, and carrying motorists from the ending MD 665 (Aris T. Allen Boulevard) to both I-97 and I-595. Photo taken 12/31/16. Advancing east from the South River, U.S. 50 east & 301 (John Hanson Highway) north run along side suburban areas to Exit 21 with Interstate 97 north. Photo taken 12/16/16. One half mile ahead of the two-wye interchange (Exit 21) with Interstate 97 north on I-595 & U.S. 50-301 east. 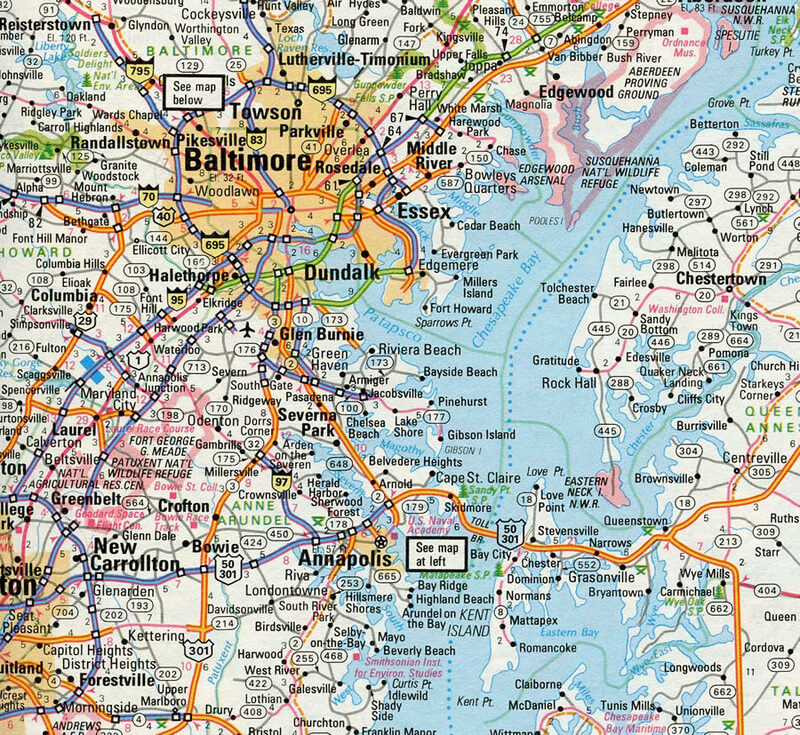 I-97 provides the first leg in a limited access route to Downtown Baltimore, located 25 miles to the north. Photo taken 12/16/16. Exit 21 separates from U.S. 50 east & 301 north for Interstate 97 north. The ensuing ramp connects with a c/d roadway joining I-97 south and I-595 east with MD 665 (Aris T. Allen Boulevard). MD 665 links the freeway with MD 2 (Solomons Island Road). Photo taken 12/16/16. “New Segment Of I-97 Opens” The Capital (Annapolis), February 17, 1991. “State Pulls Out All The Stops On I-97” The Capital (Annapolis), July 6, 1991. “Baltimore Connector Opens.” The Capital (Annapolis), March 12, 1991. Page updated June 11, 2015.